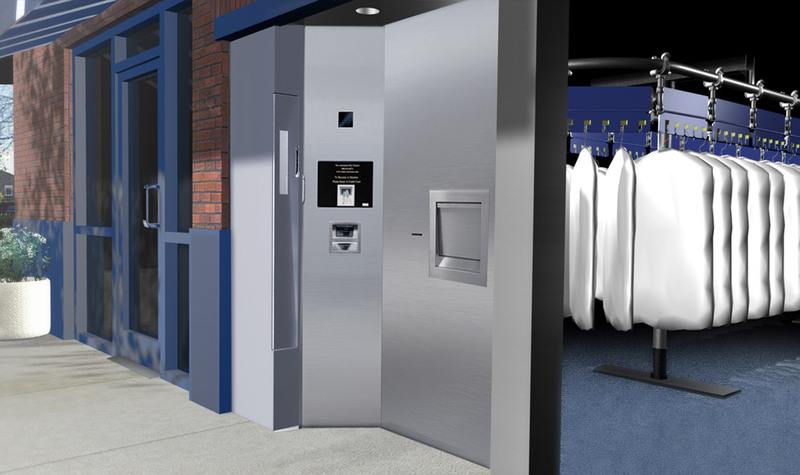 KENILWORTH, N.J. - June 4, 2003 - White Conveyors, Inc. today announced the introduction of 24-hour Automated Dry Cleaner system (ADC) that allows customers to drop off and pick up dry cleaning and laundry - day or night - reducing labor costs for dry cleaners and offering more convenience to customers. The ADC system reduces the need for counter attendants at existing drop-off locations, leading to an immediate reduction in labor costs. Besides replacing existing manned locations, the system is ideally suited for corporate office parks, apartment complexes, commuter train stations and other high-density traffic areas. It can potentially be placed 'rent free' in apartment complexes and office parks, which view an onsite dry cleaning service as a value-added perk for their tenants. Access to the free space opens up a potentially lucrative revenue channel for enterprising dry cleaners. The ADC system is secure and easy to use. Customers log onto the system (using a credit card, debit card, dry cleaner-issued VIP card or pin number), fill out an item-description ticket, place soiled clothes and the ticket in a dry cleaning bag, and deposit the bag into a drop chute. The system prints two receipts: one to be placed in the drop bag and one for the customer's records. When customers arrive to pick up their garments, they log onto the system, select 'pick-up' from the screen menu, and the system prints a customer receipt. Garments are then delivered to the pick-up door. The system will also have an optional customizable enrollment feature that allows users to set up an account on their first visit by filling out a short application, which they then place in the bag with their garments. To maximize security, the ADC system is constructed of stainless steel and special high-strength security glass. The pick-up window features a double-door (the inner vestibule door closes when the outside door opens) to prevent unauthorized access to garments. The drop-off and pick-up doors close automatically after 20 to 30 seconds. The basic ADC system is designed to accommodate 250 orders, but can be expanded quickly with modular add-ons, and is designed to go up, down and around corners. Using the same field-proven platform designed by White Conveyors for the gaming industry (for automated uniform delivery), the conveyor can operate at 800 to 1,600 cycles per day. Please contact your White regional sales manager for a competitive cost proposal. The system is factory installed and comes with a one-year limited warranty, along with a choice of extended warranty programs. White Conveyors is the world's leading manufacturer of garment-conveyor systems. For over 70 years, the company has specialized in Dry Cleaning, Laundry, Hospitality, Correctional Institution, Retail and Residential garment handling solutions that are designed to deliver relentless performance with minimal maintenance.